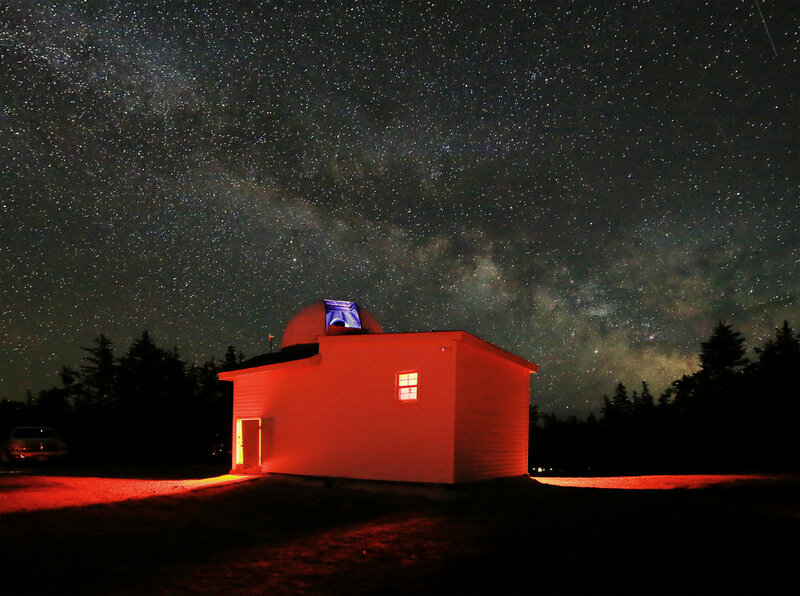 The sky spread huge and vivid as a small group of visitors wandered the grounds, then shared a heavenly viewing session, both inside the observatory and outside on the starwatch platform. I knew one of these folks – a teacher with whom I’d worked for many years – who brought three of her IB Physics students. Ironically, I had taught the father of one student! I didn’t tell her, though. One cannot appear too ancient and rust-crusted. Another member of the party had hitchhiked across Canada, reaching the East Coast and anticipating the journey’s end in Newfoundland. She was from Germany, and she said that she’d only had to walk maybe 60 km without a ride. This, friends, is the Canadian reality. People hitchhike and they enjoy positive experiences. We’re a vibrant mosaic. We accept and appreciate the vast variety of humanity. And we welcome travelers from all over the globe. Some fall in love with our country and return to settle here. But tonight, everyone was focused on the larger universe. As the assembled audience spent their time with Tim, the big scope, and the vast curve of the cosmos, I roamed with my tripod and wide-angle lens. 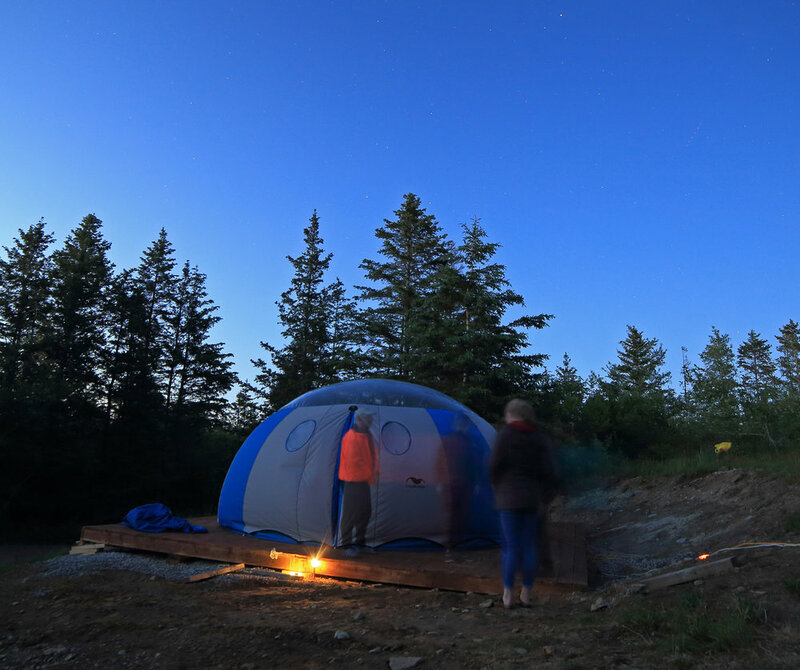 The first new bubble-dome tent was now set up. The guests took a look around inside and came away enthused at the possibilities. Later, on my own, I unzipped the flap and explored the interior. Above me, clear plastic arched with the contours of a northern midnight. I could see the Milky Way, which is at its best now and for the next three or four months. Jupiter reigned over the southern horizon. Evergreens ringed the site like a rank of guardians but didn’t intrude on the view. I stood quietly, bound by the magic of this place, this enormous bowl of worlds upon worlds. My camera remained outside as the heated space fogged the lens, but simply keeping it inside to acclimatize would have prevented this. Next time, I’ll do that with one camera and leave the other in the open air. But for now, it was enough to dream and stare. I imagined myself lying there, comfortable in a sleeping bag, snuggled down for sleep but unable to drift anywhere except upward. The starry vision circled my head. It closed on me. As a musician, I couldn’t help but be reminded of John Dryden’s “A Song for St. Cecilia’s Day”, written in 1687 but applicable here as well. 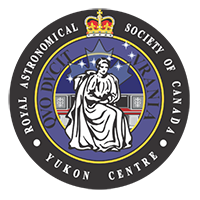 Oddly enough, St. Cecilia is the patron saint of the blind and of course, Tim Doucette is widely known as “the blind astronomer” (even though his night vision is far superior to mine). Everything connects. Dryden was writing in a spiritual context, describing the creation of the universe as a mighty and immortal work of music. Bach’s “Toccata and Fugue in D Minor” seems to fit, although the poet wouldn’t have known that, as he was dead by then. But I knew it, while I listened to the silence and gazed in wonder at the “universal frame” within that celestial circle. Perhaps I have always known it. Astronomy then becomes a synesthesia of sound and movement and light. I reflected on all these things as I took the winding road home.